After the San Francisco and San Jose Railroad was completed in 1863, Menlo Park became a popular destination for vacationers. To accommodate these and other travelers, brothers Martin and Diedrich Kuck opened a hotel in 1868 on the north side of Oak Grove Avenue next to the RR tracks (presently the site of a self-service car wash). The Menlo Park Hotel served meals and also had a general store on the first floor. It was surrounded by colorful flower gardens and picnic areas. Horses and carriages were available from the stable. The hotel suffered a major fire in 1896, but was quickly rebuilt. The black and white photo (above) is from 1899. With the passage of time, and perhaps more importantly, the advent of automobile travel, the hotel became less popular, was allowed to deteriorate, and was finally demolished in 1948. After that, the hotel’s picnic grounds continued to be used at least for a few years for Menlo Park’s annual 4th of July BBQ that followed a parade through the downtown area. 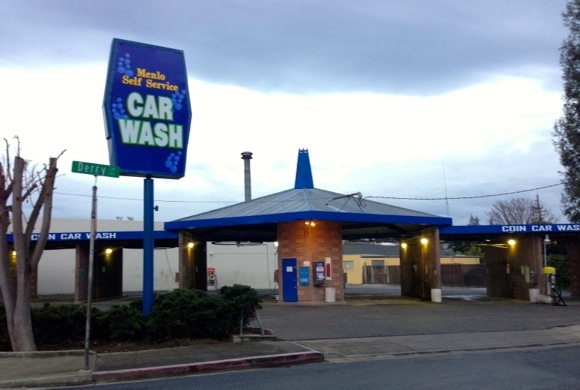 Now it’s the site of a self-service car wash (photo below). Previous post: Spotted: Spring cleaning = time to get rid of the Christmas tree!